Chandrababu is a man of words, not actions. Vizianagaram: YSRCongress leader Kolagatla Veerabhadra Swamy flayed Andhra Pradesh Chief Minister N Chandrababu Naidu. He said, “Chandrababu, who is not in a position to fight Prime Minister Narendra Modi, is making baseless comments on YSRCongress chief YS Jagan Mohan Reddy.” Chandrababu wants to benefit politically by associating YSRCP’s name along with Narendra Modi, he added. However, the people of the state can seen through his game. The YSRCP leader added Chandrababu is a man of words, not actions. He took up Navanirmana Deeksha, while staying close to Narendra Modi. Now again he is pretending to stage Dharma Porata deeksha after forging an alliance with Congress. The people of Andhra Pradesh have hung their heads in shame with this behavior of Chandrababu. The people of AP are being made scapegoats for his political benefits, Veerabhadra Swamy added. 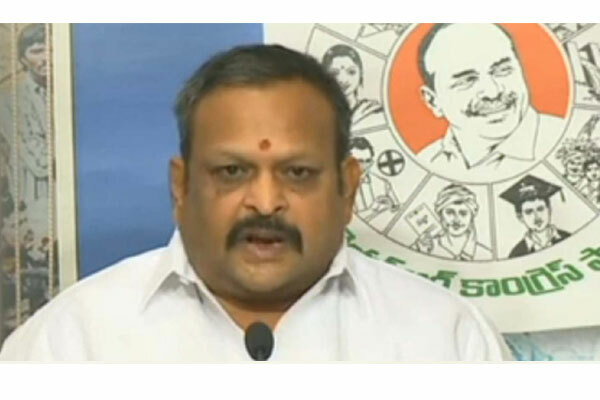 Kolagatla challenged Chandrababu Naidu to release white papers on the irrigation projects so far completed. He wondered whether Chandrababu has the nerve to ask the voters of AP to defeat turncoat MLAs in the elections, who switched over from YSRCP, just as he demanded in the Telangana elections.